Using a beach wedding parasol can help you and your guests stay cool and add a touch of simple elegance to a sandy wedding theme. Parasols can be added to multiple areas of your wedding, from a bridal accessory to topping off a signature cocktail. A parasol can make a great bridal accessory. Whether it is an alternative to a wedding bouquet or used for photographic effects, it is an interesting element to use at a beach wedding. 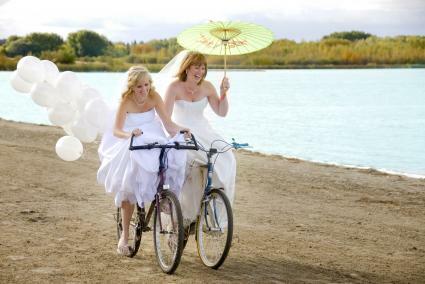 Brides who want to use a parasol as a beach wedding accessory should choose one that reflects the tone of the wedding. Although a theme unto itself, a beach wedding might also be Asian-inspired or island themed. Weddings held on the beach can be informal gatherings or elegant galas. Pick out a parasol that reflects the overall tone of your wedding. Consider your beach wedding dress design and wedding colors when picking out a parasol. White Cathedral Battenburg Lace Parasol - A white lace parasol that's perfect for a bride who wants a delicate look to her accessory. Antiqued Battenburg Lace Parsol - This parasol comes in a small or large size with an antique look, perfect for a vintage beach wedding. Off-White 28" Gilded Parasol - The gold henna design on this parasol makes it a luxurious choice for any bride who wants an elegant beach wedding. Hand Painted Blue Flower Parasol - A gorgeous white and blue floral painted design reflects the colors of the water and adds something special to the bride's accessories. A bride is not the only one who needs shade from the sun at a beach wedding. Cute parasols make great gifts for bridesmaids, can be used in photos, and are a unique bridesmaid bouquet idea. 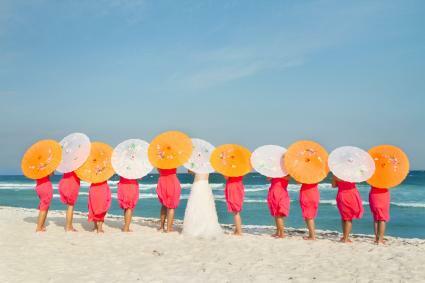 Colored parasols are great choices for bridesmaids and can match the bridal party dresses. Brides who want to add a personalized touch to the wedding can have their bridesmaids each paint a simple design on their parasols prior to the wedding. Use stencils and have a select number of colors to ensure they all match. Do this as part of a bridesmaids luncheon, spa day, or other girls' day out. Guests will appreciate parasols, as they often arrive early for the ceremony and must sit in the warm sun. Place parasols at the end of the main aisle in buckets for guests to take as needed, or alongside each seating row. Paper Parasols - Low cost paper options come in a variety of colors and some even feature designs like blossoms or cranes. Solid Color Scalloped Parasols Umbrellas - Select from 12 different colors of parasols that have a lovely scalloped edge. Tropical Parasol - Give these parasols with tropical sunset designs out at a casual, fun wedding for guests to keep after the ceremony is over. Parasols don't have to be held to include them in your wedding. Use small parasols as accessories throughout your event. For example, before the ceremony starts, pick out beach wedding invitations and programs featuring parasol graphics. Prop a miniature parasol on the guest book table. Top altar flowers with parasols that cover the arrangements. Have the flower girl carry a parasol down the aisle. Bridesmaids can carry mini parasols with flower blooms in lieu of traditional beach bouquets. Line the aisle with open parasols instead of floral arrangements, shepherd's hooks, or other decorations. 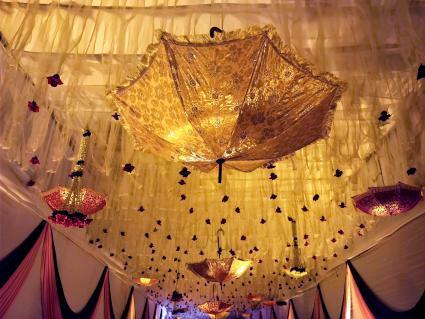 Add parasols to the corners of bridal arches and canopies covering an outdoor dance floor. Hand out parasols as your wedding favors. Include parasols in wedding cocktails. Place small parasols in your reception centerpieces. Decorate behind the head table with parasols. Hang parasols from the ceiling at an indoor reception or beach wedding tent, or hang them from trees at an outdoor beach reception. Parasols make a great addition to your beach wedding theme. Whether you simply use them to keep the sun off your shoulders or you add them throughout the festivities, they add a little something extra to your wedding.